I’ll be perfectly honest. I love BlueSky Software. 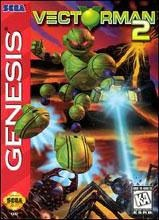 Be it the unmatched-to-this-day World Series Baseball games, or that loveable little dude made of balls, VectorMan, no one can deny that BlueSky was at the forefront of Genesis development. Even after so much time, most of their games still look and play as well today as they did when they were originally released. That’s why I jump at the chance to talk to anyone who worked at BlueSky. I was lucky enough to chat with Rick Schmitz, who was a background artist at the company for almost four years. There, he labored on a myriad of titles, including the famed VectorMan series, for which he doubled as a designer. His work has taken him all over the industry, and he has spent the last seven years at Sony Online Entertainment, where he has served in many different capacities on their EverQuest line of games. Schmitz currently resides in Norfolk, MA, with his wife and two daughters. Mr. Schmitz had some insightful stories to tell about his time at BlueSky. Sega-16: How exactly did you start working at Sega? Rick Schmitz: I was encouraged by a good friend, Joe Shoopack to join him at Bluesky software. We had both worked at an educational software company before that time. After I was there for a while, Sega bought Bluesky. Sega-16: What exactly was your role in the original VectorMan? Rick Schmitz: Very small, to be honest. The game was mostly done when I was asked to contribute. Vectorman himself had a lot of on screen personality, but he was only an inch tall…we didn’t have any idea what he looked like close up. I was asked to give him a look for marketing purposes. All the images of him on the box art, the intro pictures, even the TV ad (which was also made at Bluesky), were based on my designs. I drew him in a bunch of poses that the 3D artist could use as a guide for promotional art. The true hero of Vectorman concept art is Ellis Goodson. He made tons of concept drawings of most of the characters, environments and game mechanics for the game. He is also a real character himself and one of my favorite people on the planet. Here’s a little bit of Genesis trivia: The sound that Earthworm Jim makes when he is injured (“Aow!”) is an imitation of Ellis getting hit with a paintball! Sega-16: Were there any concepts that didn’t make it into the final game? Rick Schmitz: I’m sure there were plenty, but I can’t say for sure which ones. Sega-16: It seems you had a much bigger role in the sequel to VectorMan. Just how big a part of its development did you have? Rick Schmitz: In those days development teams were much smaller than today. Artists and programmers need to were a lot of different hats…So not only did I make final game art but I did a lot of concept work for the general theme of the game, concept work on the different levels for the game, worked out the actual maps for the levels and play-tested all of the above. 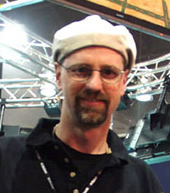 The lead programmer, Keith Feiheit, also did a lot of game designing and testing as well as implementation. There are other great people that were on that team, too, like Rick Randolph and John Abad and our producer Jerry Huber. Every artist was responsible for the design as well as the art of his or her own levels… I think I ended up making about half of the levels for VM2. I also made some animations for some of the mini games for VM2. As far as levels go, let’s see if I can remember…I made the swamp level including the art for the swamp boss (nicely animated by Marty Davis, who was responsible for all the “vector” animations of VM himself and his enemies in both VM and VM2), the roller-skating level, and the end-of-game boss level (I made the spider for that too). Sega-16: Were there ever any plans that you know of to bring VectorMan to the Sega CD or 32x? Rick Schmitz: Not that I ever heard of, I’m afraid. Sega-16: It seems like there was a pretty open atmosphere at BlueSky Software. During your time there, were there any ideas that had didn’t get the green light from Sega? Rick Schmitz: We were in line to do an Aladdin game. As I remember it, the producer on it fell out of favor with Disney and it was picked up by another company. We also began working on an X-Men game. We got pretty far on it but the project was cancelled. It turned out that a 3rd party company had a contract that gave them first shot at it…at least that’s how I remember it. 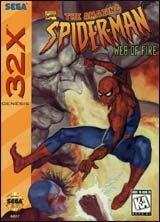 Sega-16: You worked on Spider-Man: Web of Fire for the 32X, which was the last U.S. release for that system. What are your thoughts on the hardware? Rick Schmitz: The 32 X was billed as a transition device to keep Sega fans happy while waiting for the Saturn, but it didn’t turn out quite that way. As I recall, graphically speaking it gave us a few new tricks. We could do some new things with the parallax scrolling, for example, but their use came with added limitations. The Spider-Man game turned out very well, though, especially the feel of the web swinging. It’s a shame that we only had the license for second-string villains and that the user base for the 32X never became very large. Sega-16: You had a hand in some great cartoon-to-game translations, like Roadrunner and Coyote in Desert Demolition and Ren and Stimpy: Stimpy’s Invention. How hard was it to accurately bring such famous characters to video games? Rick Schmitz: Roadrunner was a bear… Warner Bros. had a strict rule: the Coyote could never catch the Roadrunner. That is very faithful to the cartoons, but deadly for a game. If you are the Coyote, you can never win and if you are the Roadrunner you can never lose! I think that inherently reduced the quality of the game. Also, Warner Bros. Didn’t have a good handle on the capabilities of the system. For example, we had some victory screens that featured other Warner characters. We would send the art to Warner and they would send it back with comments. I remember them being very exacting on what the characters should look like and asking for subtle changes to Tweetie’s head when it was only 6 pixels wide! There’s only so much you can do with a 6×6 pixel image! Ren and Stimpy was much more loose…I don’t remember Nickelodeon having any problems with what we came up with. That was a pretty innovative game, from a gameplay standpoint. The cooperative aspects made it a fun game for 2 players with out it being a competition. Sega-16: What was your role in Shadowrun? Rick Schmitz: I was one of the background artists. That was the first game I worked on at BlueSky and where I learned to make Genesis game art. It was a somewhat painful experience because making art from 200 16×16 tiles and 4×4 groupings of tiles is really hard to get ramped up on…it’s not intuitive for a guy that was trained as a studio artist. Still, there was some fun stuff in there…I was very pleased with myself for coming up with the desktop Cray computers sitting on the desks in the offices. Sega-16: Were there any Sega characters you would like to have worked on? Rick Schmitz: Gosh, I never really thought about it…it might have been fun to make a Sonic game with a more quirky edge—Sonic in a Bluesky style! Sega-16 is grateful for Mr. Schmitz for giving us this interview, and wish him all the best for the future.